Your tour guide will meet you at Istanbul port with a sign “Your Name” on it. First, you will drive to the 11th century St. Chora Church. Some of the very finest Byzantine mosaics and frescoes can be found in the Church of St Saviour in Chora. Little is known of the early history of the church, although its name “in Chora”, which means “in the country”, suggests that the church originally stood in a rural setting. 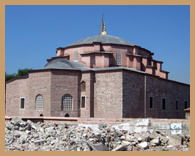 Then, drive to the Old City to visit the “Church of the Holy Visdom”, Hagia Sophia which is among the world’s greatest architectural achievements. More than 1,400 years old, it stands as a testament to the sophistication of the 6th century Byzantine capital and had a great influence on architecture in the following centuries. 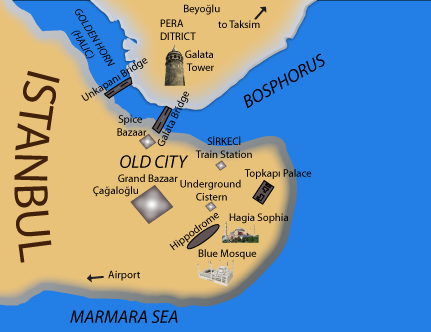 After visiting Hagia Sophia, we will walk at the Roman Hippodrome Square. The old buildings and shops in this area are built on top of the old settlements. To see one of the best examples, we will visit the Cistern under Nakkas Store. Some of the artefacts found in those underground cisterns are from Hellenistic and Byzantine periods. The Nakkas cistern is today used as an exhibition hall. Our final visit is to the nearby Church of SS Sergius and Bacchus, also known as Little Hagia Sophia Church founded by Emperor Justinian in 527. Shopping opportunity (optional) in Grand Bazaar area before returning to your cruise ship. Transfer back to the Istanbul port. End of our services.